A late hunter-gatherer necropolis has been discovered and researched by Czech scientists. The area of Sabalonka, some 80 Km north of Khartoum, includes a large necropolis of some 400-450 burials, believed to be from 8-10,000 years ago. Along with the burials, still awaiting radiocarbon dating, the archaeologists found a network of nearby settlements. So far 30 skeletons have been recovered, many with personal ornaments made of shells, ostrich egg and bone. Other objects found are bone needles and domestic tools made of bone and horn. The site is at risk in the mid-run because of a planned dam, also the researchers are somewhat concerned about funding, even though the project is low-cost. Sources[es]: Paleorama en Red, Radio Praga. Jeffrey I. Rose et al., The Nubian Complex of Dhofar, Oman: An African Middle Stone Age Industry in Southern Arabia. PLoS ONE 2011. Open access. I strongly recommend reading this paper in full: it really deserves your attention. The Nubian techno-complex is a facies of the pan-African Middle Stone Age macro-culture (MSA for short), which is roughly equivalent in timeline to the Middle Paleolithic of Europe (and, as techno-culture, to Mousterian in this other context). A facies that is mostly concentrated in North Sudan and Upper Egypt (with the occasional Ethiopian site) and, now we get to know, in Dhofar (Oman). Late Nubian Complex assemblages have been found in stratigraphic succession overlying early Nubian Complex horizons at Sodmein Cave  and Taramsa Hill 1  in Egypt; in both cases separated by a chronological hiatus. 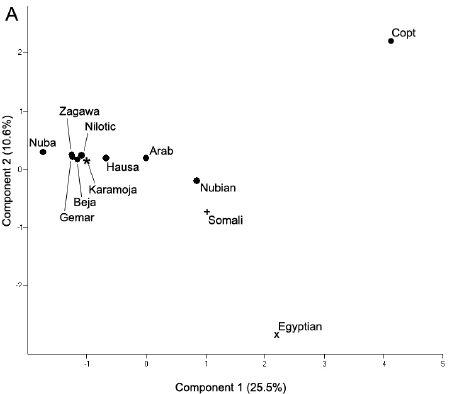 The early Nubian Complex roughly corresponds to early MIS 5, while numerical ages for the late Nubian Complex in northeast Africa fall in the latter half of MIS 5. For the time being, the apparent distribution of Nubian Levallois technology in Arabia is limited to the Nejd plateau and, perhaps, Hadramaut valley (Fig. 1). 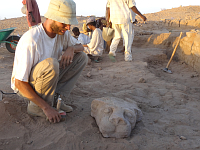 Archaeological surveys in central/northern Oman have not produced any evidence of Nubian Complex occupation , , nor have Nubian Complex occurrences yet been found in eastern , –, central, or northern Arabia –. Note that the authors’ concept of Nedj plateau does not correspond with that of Wikipedia, as they are obviously talking of the sites in highland Dhofar and not anywhere in Saudi Arabia (see map below). The authors express their expectation that eventually other sites will be found within drainage systems along the western coast and hinterlands of central Arabia, linking Nubia with South Arabia. However it is also possible, I’d say, that the actual link is via the Horn of Africa, specially as Arabia has been quite extensively combed in recent years. Taking into account its distinct, regionally-specific characteristics, Marks  notes that the Nubian Complex has no exogenous source and, therefore, probably derives from a local Nilotic tradition rooted in the late Middle Pleistocene (~200–128 ka). This supposition is supported by the early Nubian Complex assemblage at Sai Island, northern Sudan, which overlies a Lupemban occupation layer dated to between ~180 and 150 ka. The oldest known Lupemban culture is dated to c. 300 Ka ago in Kenya and Tanzania. The authors reject the presence of Nubian Complex tools claimed in the past for the Levant (Levantine Mousterian) and Persian Gulf (Jebel Barakah). The first hint of the Nubian Complex extending into southern Arabia was documented by Inizan and Ortlieb , who illustrate three cores from Wadi Muqqah in western Hadramaut, Yemen, with Nubian Type 1 and Type 2 technological features. More recently, Crassard  presents a handful of Levallois point cores exhibiting Nubian Type 1 preparation from Wadi Wa’shah, central Hadramaut, Yemen. The chronological reference of Marine Isotope Stage 5, time frame of the Nubian Complex, corresponds to a warm period between c. 130 and 74 thousand years ago, and corresponds very roughly with the Abbassia Pluvial, when the arid region of the Sahara and Arabia was quite more welcoming. Fig. 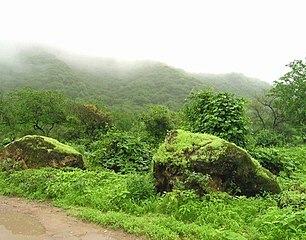 3 Dhofar ecological zones and place names mentioned in text. MIS 5 was followed by MIS 4, a cold and dry period triggered by the Toba caldera explosion (supervolcano). … the monsoon increased in intensity during three intervals within MIS 5. Among these humid episodes, the last interglacial (sub-stage 5e; 128–120 ka) appears to represent the most significant wet phase within the entire Late Pleistocene, with rainfall surpassing all subsequent pluvials , . Later, less substantial humid episodes associated with sub-stages 5c (110–100 ka) and 5a (90–74 ka) are also attested to in the palaeoenvironmental record. Uncertainties remain concerning the extent to which the climate deteriorated in the intervening sub-stages 5d (120–110 ka) and 5b (100–90 ka). The increased humidity provided water security to all the region and is also correlated with plant and animal migration from Africa, what the authors think should almost forcibly make humans participant in this overall biological outpouring. The authors discard the Levantine route because of the techno-cultural isolation of the Shkul-Qafzeh group. They acknowledge the conceptual debt to population genetics for unveiling the probable Arabian route Out of Africa, with particular mention to Behar 2008, who points to the possibility (that I have re-elaborated myself on my own means but on his data) of mtDNA L3’4’6 (and I’d say also L0) having left very indicative remnants in Arabia Peninsula. However they make unnecessary conceptual contortions in order to adapt archaeological knowledge to the molecular clock pseudo-science when it must be the other way around, if anything. No need. … we surmise that at least two technologically (hence culturally) differentiated groups were present at this time: Nubian Levallois in southern Arabia and centripetal preferential Levallois with bifacial tools in northern/eastern Arabia. … north-south demographic exchange between ~60–50 ka. South Arabian populations may have spread to the north at this time, taking with them a Nubian-derived Levallois technology based on elongated point production struck from bidirectional Levallois cores, which is notably the hallmark of the Middle-Upper Palaeolithic transition in the Levant , . But the whole Persian Gulf and Arabian Sea area, not to mention East Asia, remains to be fit in (archaeologically speaking) if we are to understand this period’s colonization of West Asia from the East (according to the genetic data). Rémy Crassard and Céline Thiébaut, Levallois points production from eastern Yemen and some comparisons with assemblages from East-Africa, Europe and the Levant. Quickly some archaeological or otherwise prehistorical news, mostly (but not only) from Stone Pages‘ newsletter ArchaeoNews. Paranthropus sp. were patrilocal: enamel analysis finds that females were much more mobile than males in this hominin genus > SD. Autism was maybe selected for in scattered hunter-gatherer populations > SD. The effective population size of the first Native Americans was maybe of just 70 > Daily Mail [update: it seems to be on <a href=http://www.plosbiology.org/article/info:doi/10.1371/journal.pbio.0030193 >a 2005 paper</a>, not really new]. Geometric rock art and “rock gongs” in Northern Sudan (Wadi Abu Dom) may be 5000 years old > Live Science, UPI. Newly found Australian skull might date to as much as 25,000 years ago > ABC. Barrows (tumuli) excavated in Dorset (England) before the sea destroys them > BBC. Large dolmen tomb discovered at Srikakulam (Andrah Pradesh, India) > Times of India. Hima M.A. Babiker et al., Genetic variation and population structure among Sudanese populations as indicated by the 15 Identifiler STR loci. BMC Investigative Genetics 2011. Open access. 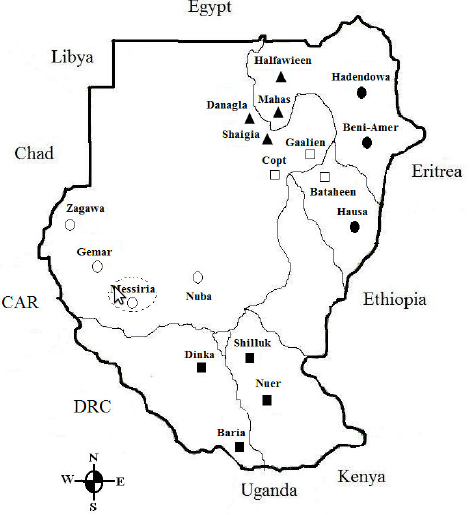 Most interestingly they spot a cline and divide (both) between Egypt and Tropical Africa and differential genetics for Somalis, one of three outgroups (the other two being Egyptians and Ugandans from Karamoja region (Nilotic ethnicities). The structure shows (as much as a mere three components allow) a duality of some clinal value (i.e. not absolute but relative) with a divide cutting across Sudan: not just between North and South according to the latest political split but also placing Darfur, Kordofan and the Nuba along with Tropical Africa as well. Instead Central, North and Eastern Sudanese look much like Egyptians. Somalis are clearly different however but you’d never know based only on K=2. That’s why it is important to explore these analysis to some depth, greater than K=3 in any case, a very shallow depth for such a diverse region. Notice that PC2 and PC3 are of similar values. PC1 however is more than double in importance and marks a cline between Egypt (and the Sudanese Copts) and the Nuba. PC2 and PC3 only show distinctions between Copts and Egyptians and Copts and Somalis respectively. I wonder if this last is caused because of random peculiarities of the 15 ancestry informative markers used in this study, which seem a bit too few not to cause random distortions, specially in such a poorly understood region as is East Africa.